In January of 2004 after several years hosting a political talk show on KALX radio in Berkeley, Lee decided to take his love of radio to the art gallery. With the assistance of his good friend Jim Ryan and the talents of Michael Trigilio, Jon Brumit, and many others, a 5 day event was planned at 21 Grand gallery in Oakland, CA. A collaborative project was born. Shortly after the 21 Grand appearance Neighborhood Public Radio did a 6 week broadcast 5 days/week at Southern Exposure gallery as part of “The Way We Work” show in September and October of 2004. 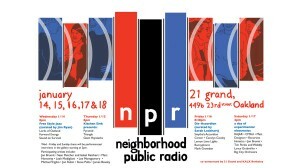 Since then Neighborhood Public Radio has experimented with all aspects of the medium of radio in various cities in the United States and Europe including residencies in Serbia and Germany, and several months of continuous weekend broadcasts from a storefront on Valencia street generously provided by Artists Television Access. In addition to founding the project and devoting substantial time and energy to the early development of the project through grant writing and administrative duties, Lee also developed independent projects as part of his practice in the collaborative.